Don your sword and chain mail to defend yourself against George the Dragon guarding his treasures along the ‘Middle Earth’ fun JRR Tolkien themed trail in the RHS Rosemoor gardens. Also this month of June ‘Meet the Pollinators’ talks and demos. Children’s play area includes a ship and large musical tubular bells. New gardens and woodland area have extended this fabulous garden. 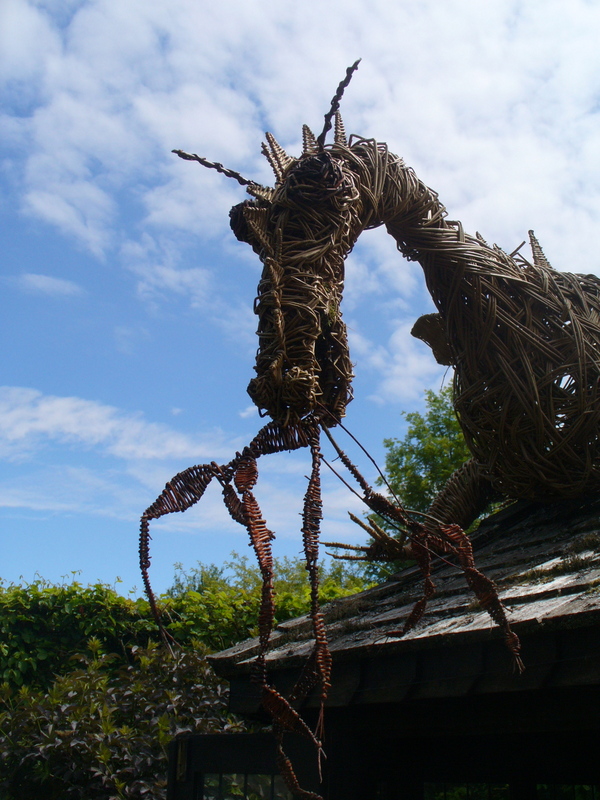 OK to picnic in the gardens but look out for Dragons who have been feasting on the real ales and ciders at a 3 day weekend festival from 6th June when local micro breweries and cider makers will be gathering to offer samples. North Devon farm holidays guests should brace themselves – there are holiday adventures of all kinds. Attractions this year include 3 wonderful Gardens and period houses. Visitors to our beautiful North Devon Farms holiday accommodation are valued guests and made welcome at the following gardens. Castle Hill Gardens: Woodland gardens with follies and temples set in 18th century parkland, Summer Millennium Garden, herbaceous boarders. Vistas, grass terraces and statues leading sown to a river and Triumphal Arch. Accommodation in this area is Townhouse Barton http:// http://www.townhousebarton.co.uk. All visitors to the North Devon farms are so welcome they give strength and support to our rural communities. Those who saw BBC’s Countryfile last week get a second chance next Sunday 27th January at 12:25pm. Set the video if out having a pub lunch. Well worth a second viewing, or constant rewind, just to be whisked back across the dramatic Exmoor countryside by a fabulous pair of Black Shires romping through the country lanes reliving the scenes played out in RD Blackmore’s Lorna Doone. 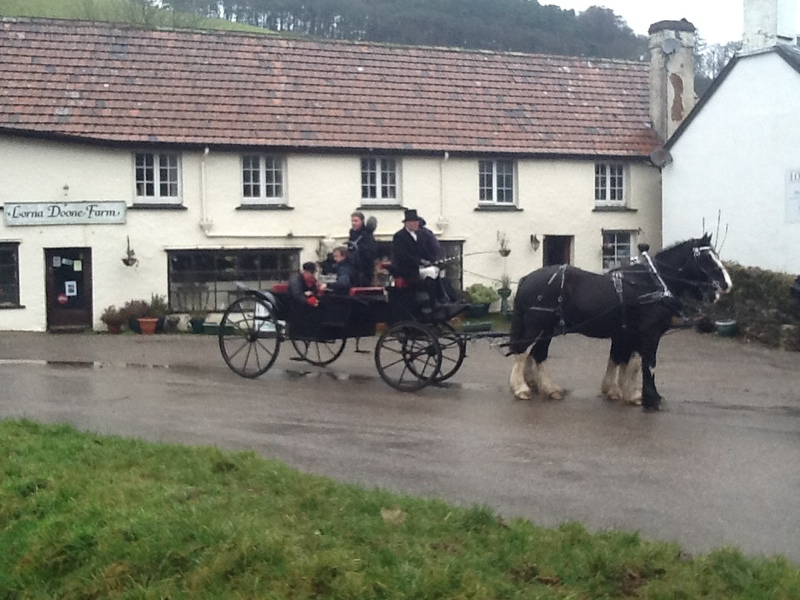 The horses pull a magnificent Landau carriage sending you back to the 1680s. The exhilaration can be felt as the pounding hooves of the Shires and the wheels of the carriage on the lanes trace the ghost of Lorna Doone. Its all tremendously atmospheric and the scenes through the Valley of the Rocks near Lynton are positively beckoning. Tourists inspired by the Countryfile adventure across Exmoor can join in themselves. No experience necessary. These Heavy Horses are owned by Jonathan ( featured driving the carriage) and Fiona Waterer who offer the horses for a wide variety of fun days. This includes driving lessons, romps over Exmoor and even taking the bride to church. Bed and Breakfast at their Higher Biddacott Farm is a real treat after which you can watch the horses in their daily work on the farm. see www.heavy-horses.net Stay on the farm and learn to drive single pairs or for the brave, a team of horses. Tuition is tailor made to the individual and unforgettable. At the 100 acre New Hill Farm horse riding along the Lyn River over the moors and around the coast is available for continued adventure holidays. Susan Bingham has ponies for all abilities. There are three self-catering cottages with views acoss Exmoor. See www.outovercott.co.uk There are hard hats, instruction and accompanied rides. Also ideally placed on the edge of Exmoor and for exploring and trekking the moors and North Devon coast – by foot – is Hollacombe Farm. A newly converted self-catering barn just perfect to put up your feet and join the fated Lorna Doone in cosy surroundings. Ring Celia and Martin or contact them at www.hollacombefarm.co.uk.